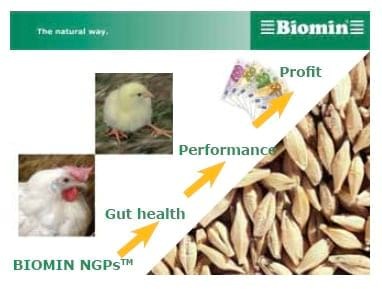 How profitable are BIOMIN NGPsTM in times of increasing feed costs? What has happened to the prices for feed? In the press release, prices for soybean, maize, wheat and barley have jumped from an average price of around 120 €/ tonne during the summer 2006 to 200 €/tonne a year later, which represents an increase of almost 70%. 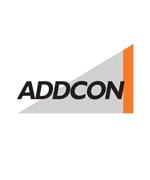 There is a distinction between shrinking supplies and increasing demand. Shrinking supplies are mainly due to dry weather and bad crops in many producing countries. Increasing demand is due to corn use for bioethanol production. In addition many developed countries have decreased their feed stocks. And, besides this, financial speculators also influenced the sharp increase on raw material prices. In order to understand the figure above please read the following pages. Enjoy reading it! Feed prices are likely to increase even further, according to Arie van Dijk, livestock feed expert from the Bureau Stigevo (Dutch agricultural newspaper Agrarisch Dagblad). Under these circumstances, strategies to improve Feed Conversion Ratio (FCR) are crucial for farmers in order to face increasing feed costs. FCR is one of the main factors driving profitability. Improving FCR leads to cost savings. The effect of natural growth promoters (NGPsTM) on FCR is based on numerous trials under practical conditions world-wide (see Figure 1). 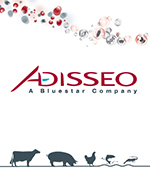 The trials provide improved daily weight gain and final body weight, as well as decreased mortality and diarrhoea cases and improved FCR for poultry, pigs and calves. FCR is the parameter with a high significance. The following cost calculation will therefore be based on the FCR improvement. The trials show that Biotronic® products are able to reduce FCR by an average of about 5%. This percentage is used therefore in the calculation. The reduction of FCR through Biotronic® SE forte is shown in Figure 2, whereby a FCR of 1.8 was taken as an average basis value. The calculation shows the benefit of Biotronic® SE forte in broiler production. All parameters are constant, except the FCR, which is related to feed intake and therefore has an influence on feed savings. No further benefi ts were considered in this calculation. As shown in Table 1, total feed intake of broilers in the trial group with Biotronic® SE forte was decreased by 1 854 kg, because of reduced FCR from 1.80 to 1.71. 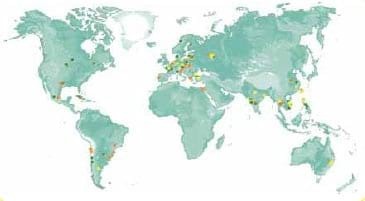 Feed prices differ depending on the country, but an increase in price is obvious worldwide. Table 2 shows the difference in cost savings due to reduced feed intake at two different price levels. In both cost regimens, the inclusion of Biotronic® SE forte reduced the total feed cost per 10 000 broilers. It is evident that, as the feed cost increases, the benefi t of Biotronic® SE forte increases markedly (Figure 3). It can be seen in the example that feed costs increased by 36% but cost savings due to incorporation of Biotronic® SE forte increased by 214%! Biotronic® infl uences feed savings and cost savings at different FCR levels. Figure 4 shows basic FCR levels and possibilities of cost savings due to use of Biotronic®, which can improve FCR by about 5%. Figure 4 shows data based on the calculation above for 10 000 broilers. As mentioned, feed costs vary depending on the country and there will be further price increases. 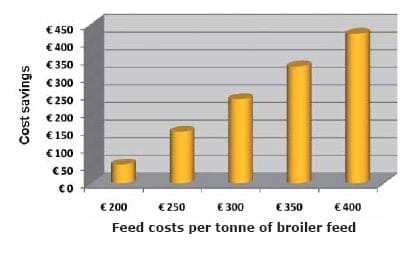 Therefore one more example, (Figure 5) shows the influence of different feed cost levels on cost savings. Data for calculations were the same as shown in the example above (10 000 broilers, FCR improved from 1.8 to 1.71). The higher the feed cost are the higher the benefit is due to the use of Biotronic®. BIOMIN Natural Growth Promoters markedly improve FCR and therefore help farmers to save money. Feed cost calculations incorporating FCR optimizing due to feed supplementation with Biotronic® SE forte highlights this effect. The noticeable outcome of this calculation is a profit difference between higher and lower feed cost. The multiple effects of cost savings because of incorporation of Biotronic® SE forte were observed. 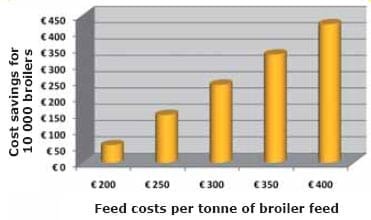 This means the higher the feed costs are the higher the benefit is due to the use of Biotronic®. A similar effect can be expected with the use of other BIOMIN NGPsTM.